This species is accepted, and its native range is Somalia to Mpumalanga. Shrub or small tree usually up to c. 5 m. tall in our area (recorded up to 12 m. in Kenya) or liane; bark silvery-grey, smooth; branchlets puberulous to tomentellous when young, glabrescent. Leaves opposite or subopposite or occasionally alternate; lamina 3–10 x 3–4·5 cm. (up to 11·5 x 5·5 cm. in Tanzania), papyraceous, narrowly elliptic to elliptic (to broadly elliptic in Tanzania), rather abruptly acuminate at the apex and cuneate to rounded at the base, usually pubescent on the nerves below but sometimes almost glabrous (except for scales), tufts of hairs in the axils of the nerves beneath absent or rarely conspicuous, lepidote below; lateral nerves 5–8 pairs, rather prominent below, slightly so above; petiole 3–20 mm. long, slender, densely pubescent to almost glabrous, sometimes sparsely lepidote. Inflorescences up to c. 10 cm. long, of terminal panicles of spikes often with unbranched spikes in the axils of the upper leaves; rhachis tomentellous to pubescent, ± glabrescent; bracts not seen. Flowers sessile, yellow or white, lepidote but otherwise glabrous. Sepals 1 x l·2 mm., broadly ovate, lepidote otherwise glabrous. Petals 1–2 mm. long, linear-elliptic, glabrous. Stamen-filaments 2 mm. long; anthers 0·4 mm. long. Disk 1·5–2 mm. in diam., pilose. Fruit 1·1–1·9 x 1–1·9(2) cm., subcircular in outline or somewhat broader than long, rufous-lepidote otherwise glabrous, apical peg absent or less than 0·5 mm. long, wings c. 7 mm. broad, stipe up to 2 mm. long. Cotyledons 2, 1–1·2 x 1·5–1·8 cm., subcircular to transversely elliptic or subreniform with petioles 2–4 mm. long, borne above soil level. Scales similar to those of C. celastroides but mature leaves with additional smaller scales as little as 50µ in diam. and with a simplified cellular pattern with down to c. 12 marginal cells. Tree or many-stemmed scandent shrub up to 12 m. tall. Leaves opposite or subopposite; lamina subcoriaceous to papyraceous, elliptic to oblong-elliptic, (1.5–)5–11.5 cm. long, (1.1–)1.5–5.5 cm. wide, apex usually ± acuminate, base acute or obtuse, glabrous or very sparsely pubescent, tufts of hairs in the axils of the lateral nerves beneath absent or inconspicuous, sparsely golden lepidote beneath; lateral nerves 4–8 pairs; petiole 6–25 mm. long. Inflorescences 3–10.5 cm. long, solitary or rarely 2–3 in the axils of the upper leaves (the leaves may fall to give the appearance of a branched terminal panicle). Flowers yellowish or white, scented. Lower and upper receptacles rufous lepidote, otherwise glabrous. Petals narrowly elliptic, 1.5 mm. long, 0.25 mm. wide, glabrous. Stamen-filaments 3 mm. long; anthers 0.4 mm. long. Disk 1.5–2 mm. in diameter, pilose, indented where the filaments are inserted, without a distinct free margin. Fruit (fig. 4/2, p. 15) subcircular to transversely elliptic in outline, 1.5–2 cm. in diameter, rufous or golden lepidote, otherwiseglabrous; apical peg absent; wings 7–9 mm. broad, sometimes flushed red; stipe 2–3 mm. long. Cotyledons 2, broadly reniform, petiolate, borne above soil-level. Scales (fig. 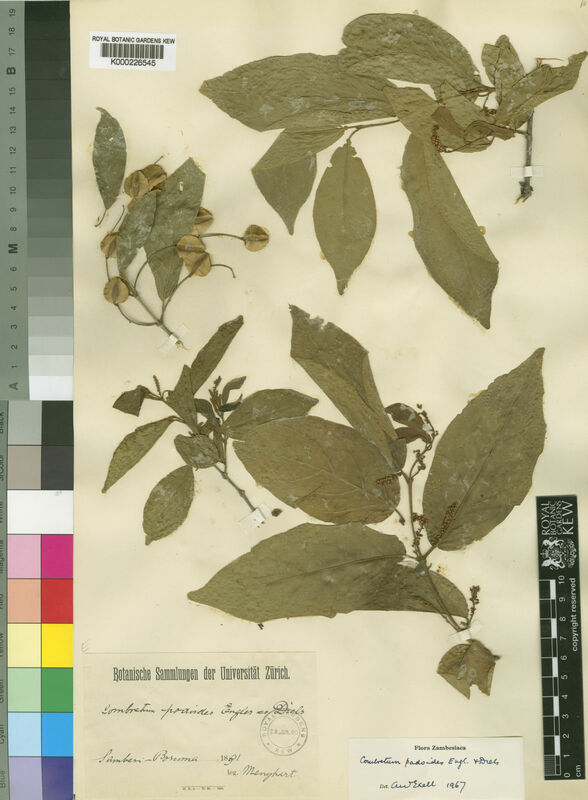 1/2, p. 12) similar to C. celastroides but mature leaves with scales as small as 50 μ in diameter. Riverine, coastal and swamp forests, also deciduous thickets; 0–1500 m.
Exell in Kirkia 7: 170 (1970). Liben in Flore du Congo Belge, du Ruanda et du Burundi, Combr. : 40 (1968). F. White, Forest Flora of Northern Rhodesia p. 284 (1962). Dale & Greenway, Kenya Trees and Shrubs p. 146 (1961). J.P.M. Brenan, Check-lists of the Forest Trees and Shrubs of the British Empire no. 5, part II, Tanganyika Territory p. 138 (1949). Engl. & Diels in Monographieen Afrikanischer Pflanzen-Familien und Gattungen 3: 13, t. 2/B (1899).